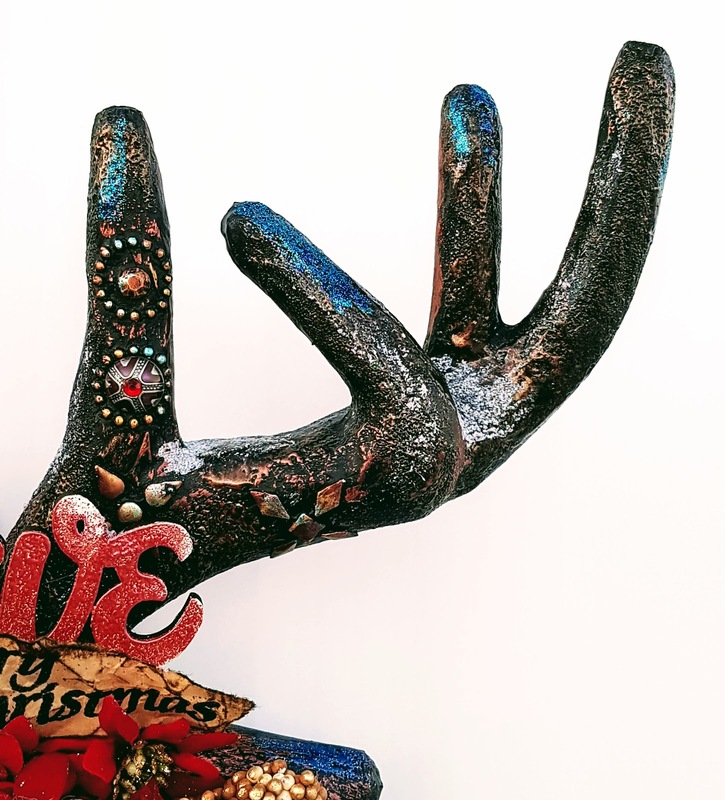 Handmade gifts, ornaments and cards have been in process, causing stress, grey hair and plenty of happiness and joy as Christmas Day approaches. 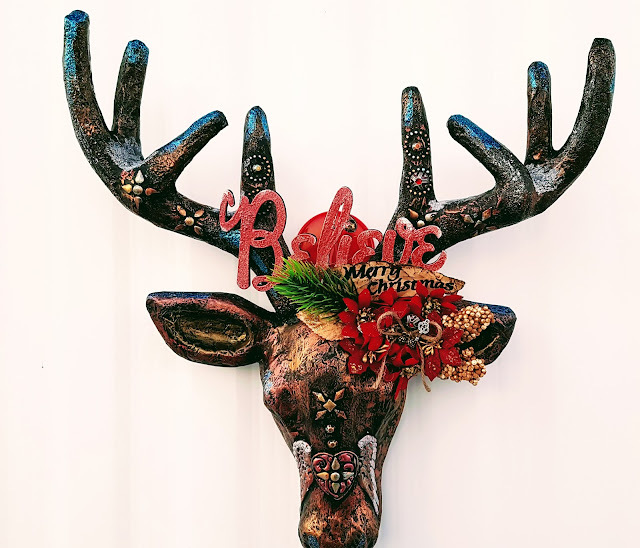 Come share your creations of gifts, cards, tags & decor! Hello everyone!!! This is my project for "Snow & Silver"... 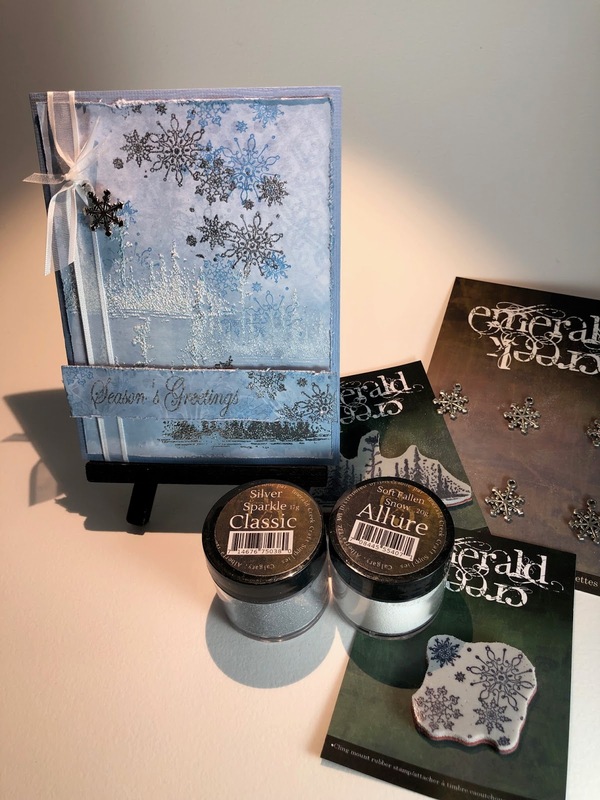 I used the Christmas Letters Stamp and the following Embossing Powders: Classic Verdigris Sparkle, Allure Midnight Sky, Allure Soft Fallen Snow, Magical Mysteries: Fairy Wings Blue, Fairy Wings Green and Mermaid Fin. Hello from Tennessee! 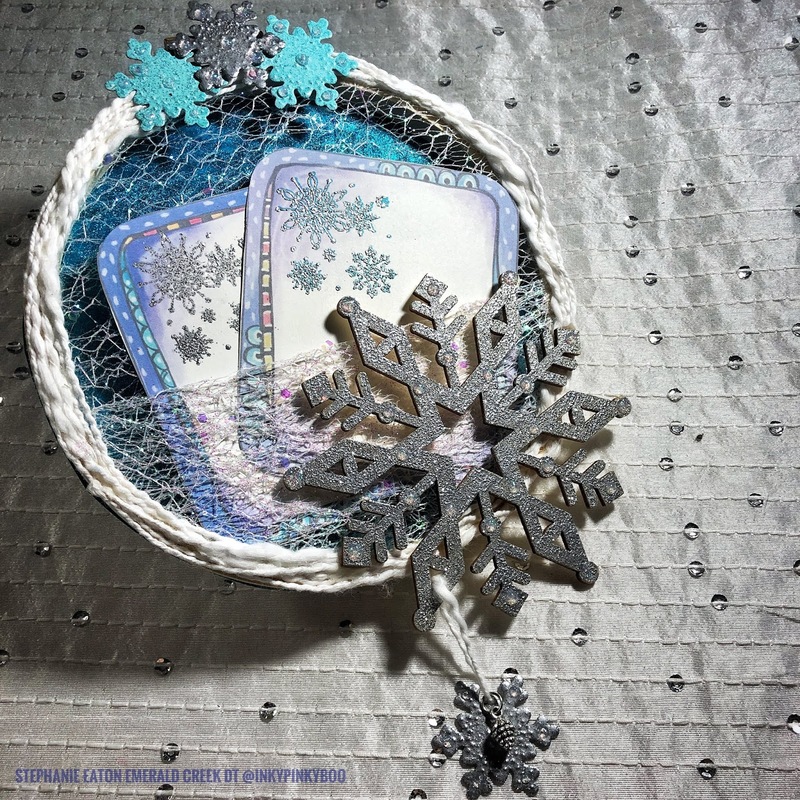 Stephanie, here to share a fun wintry wall hanging for this month's Dare Challenge! We don't get much snow down here in the south so I decided to create a snowy wall hanging. The wall hanging can be used for notes or maybe outgoing mail or just pretty winter decor. 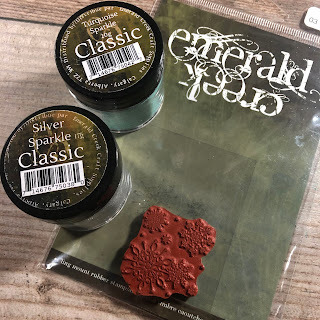 I used several Emerald Creek embossing powders, stamp and charm. The wall hangings base is a wooden embroidery hoop. 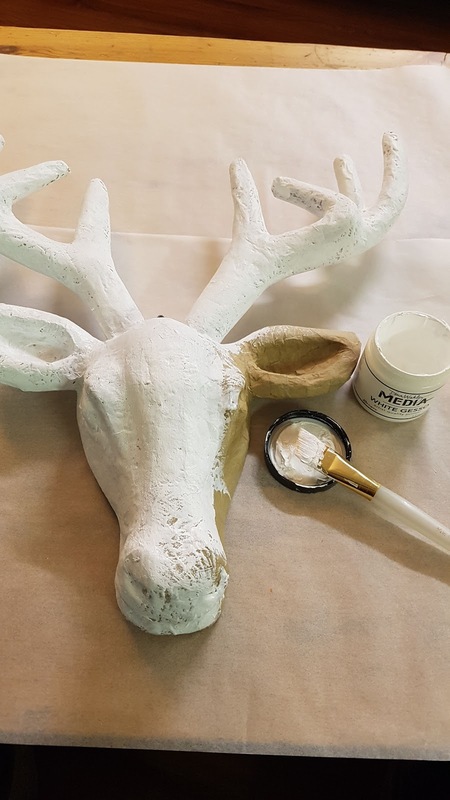 I painted a scrap piece of paper with Art-C Luxe paint. To create the pocket (for mail, notes etc) I stretched one layer glitter tulle over the hoop and then folded another piece of tulle in half. Natural cotton fibers are wound and glued around the rim of the embroidery hoop. I embellished the the hoop with wooden and metal snowflake diecuts. 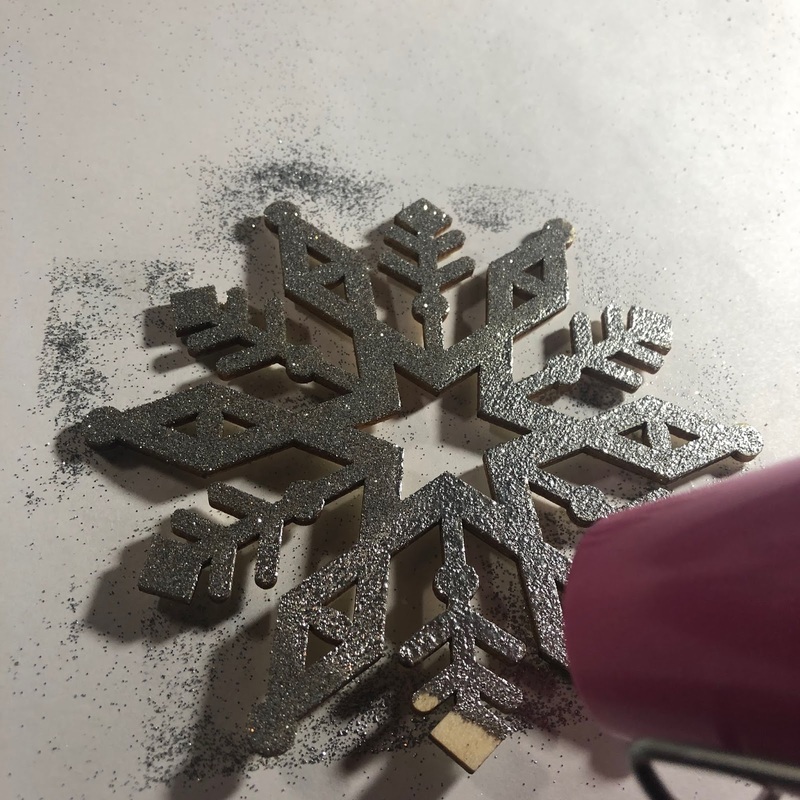 The large wooden snowflake is embossed with Silver Sparkle (has to be the most beautiful silver and perfect for winter crafts). 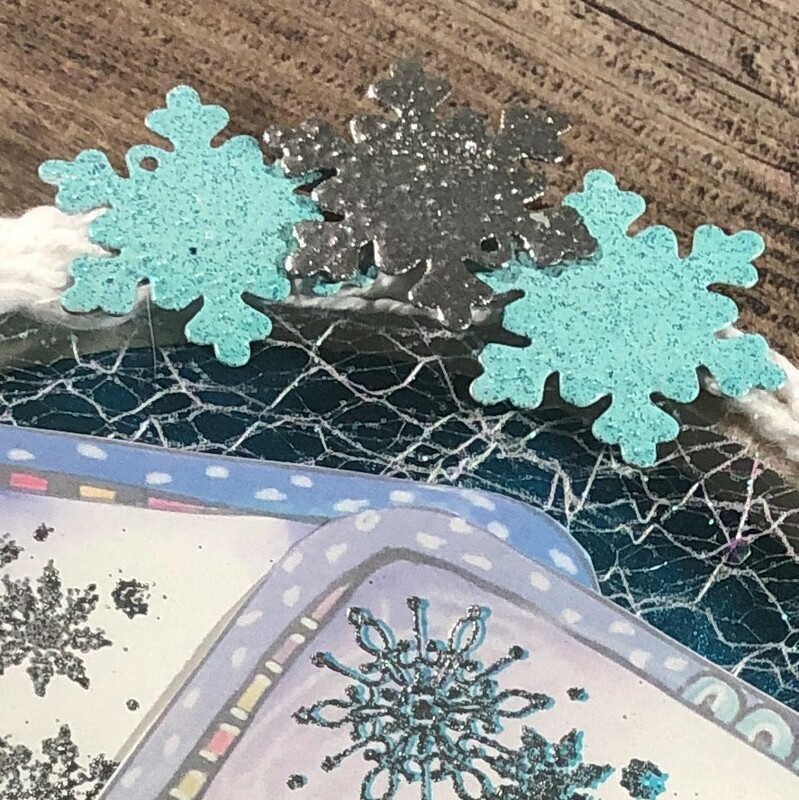 The metal snowflakes are embossed with Turquoise Sparkle and Silver Sparkle EC embossing powders. 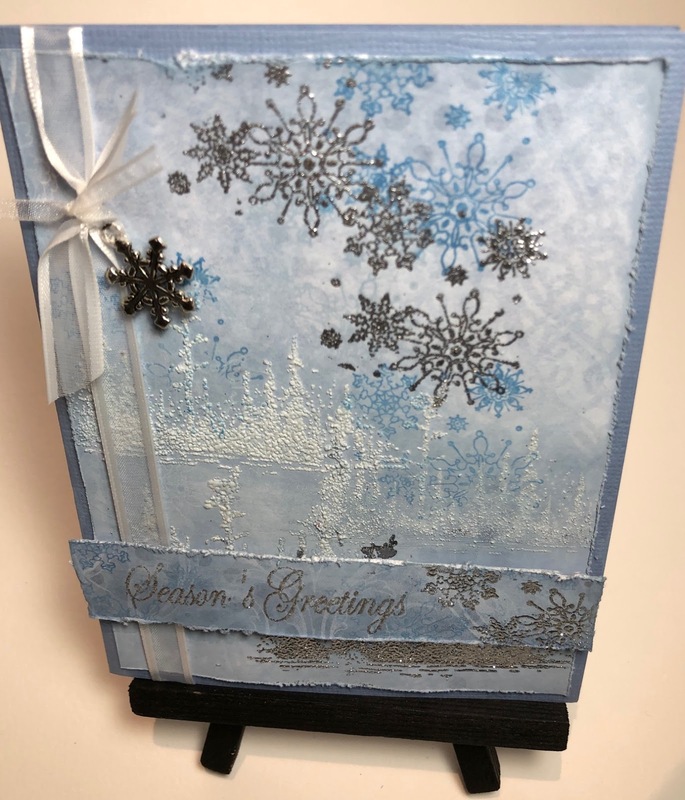 I stamped two Vera Lane Studio journal cards I had in my stash with Snowflake cling mount stamp. The colors matched perfectly for this project. One card is stamped with embossing ink and Silver Sparkle. The second card is double stamped with aqua ink and then offset a bit and embossed with Silver Sparkle. Isn't that just beautifully sparkly?! To finish the wall hanging I tied another Silver Sparkle embossed snowflake and added a Pinecone charm. I added a few Glossy Accent dots on the snowflakes for a little extra added dimension. Thanks for stopping by today and I hope everyone has a Merry Christmas and Happy Holiday! Don't forget to join the challenge as well! 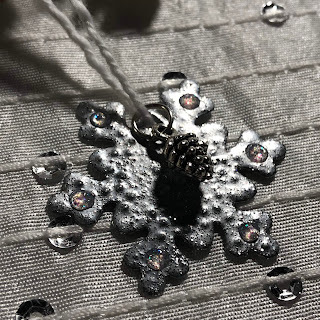 Livia here with December's theme "Snowflakes and Silver"
Soft Fallen Snow added here and there. Paper bag, inked with a Tim Holtz ink pad and torn to fit. Playing with my EC products, it was a blast! Welcome back to the Emerald Creek blog. 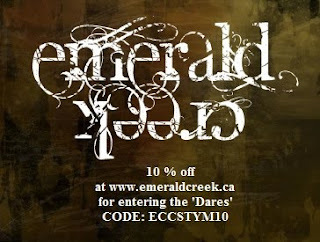 Have you joined the Emerald Creek Dares challenge yet? This month's theme is so fun! 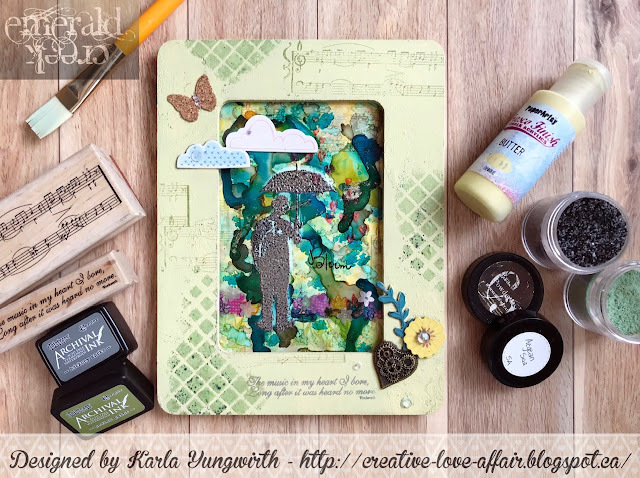 I created a card and ATC set using a variety of Emerald Creek stamps, trinkets and embossing powder. Feel inspired to join the challenge yet? Or do you have a better idea on how to interpret the theme? Then go ahead and show us! Hello friends! 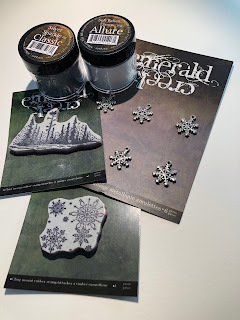 Karla here today with another fun and festive project for this month's Dare - Snowflakes & Silver! How fitting for December, especially here in Canada where we've had snow off and on since October! 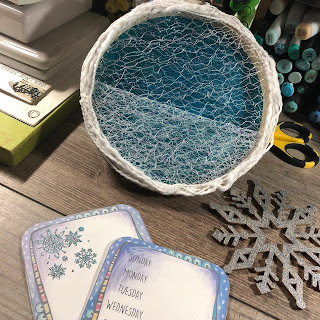 Today, I'm sharing a Mitten Ornament project using lots of gorgeous Emerald Creek Craft Supplies and a cute pair of mittens diecut from chipboard. 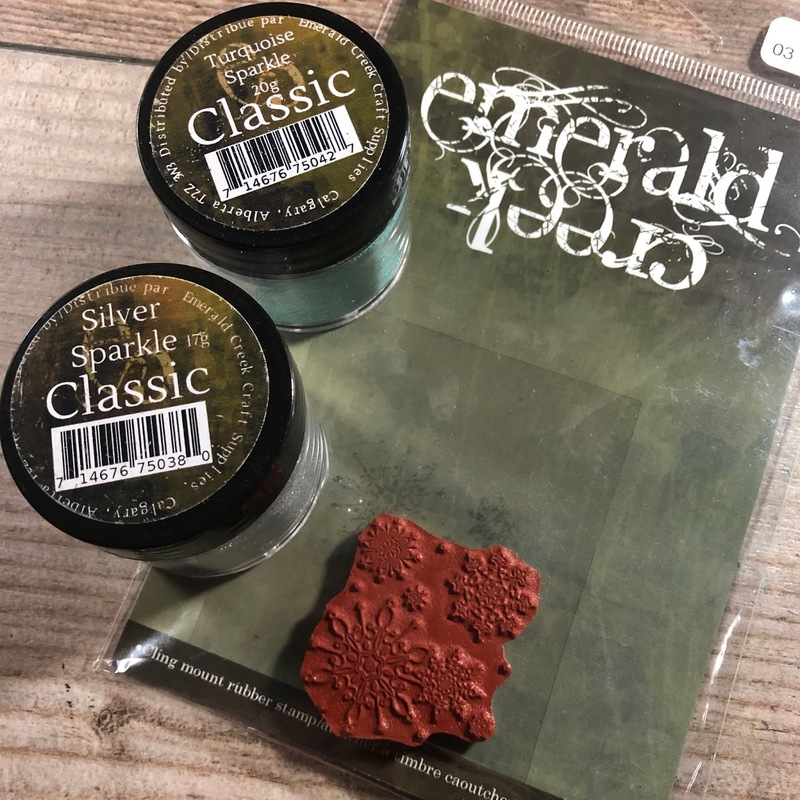 If you have chipboard lying around (ok, who doesn't...) don't forget that embossing powder is a fabulous way to alter it! I really love the effect when melting a second layer of embossing powder over another colour! 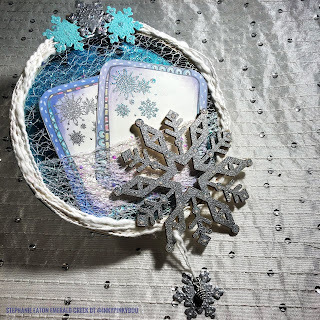 On this project I mixed the beautiful detailed Silver Dollar powder with the Mermaid Fin powder on the pretty wood veneer snowflakes, and with one of my favourites, Fractured Ice, on the mittens. The silver pine cone charm was too cute not to tie on to the mitten string with a bit of silver thread! I think these mitts do look like they'd be warm and cozy on a frosty day! On the back I used two beautiful cling stamps from the Emerald Creek Shop. I just love the script on the Season's Greetings stamp and the snow caps on the To/From stamp! 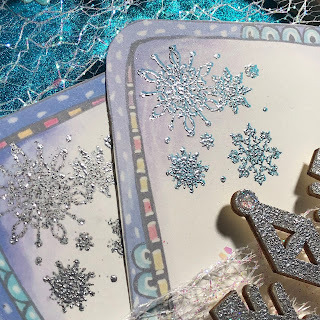 Here's a look at the VIDEO where you can get a good look at how I put it all together and watch the magic as I melt different embossing powders into each other! Thanks so much for stopping by today! 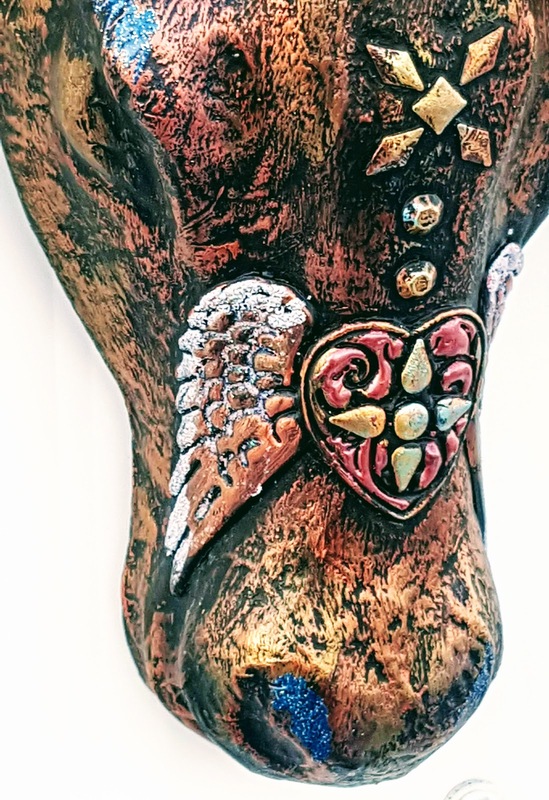 I hope you join us and enter your project for a chance to win. Have a wonderful crafty December, and a very Merry Christmas. Hi Everyone! Are you ready for December fun with snow and silver? I think this project might just fill the bill for your holiday card making needs. 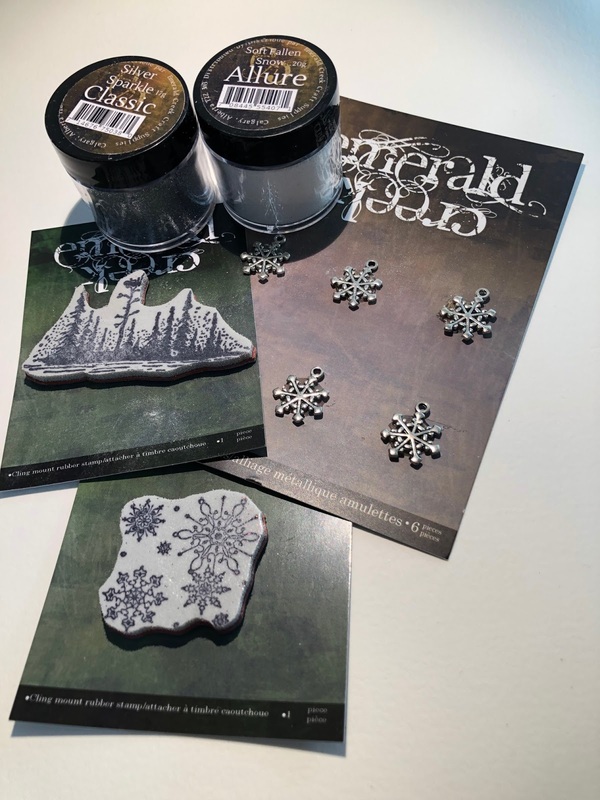 I was having a blast using these festive Emerald Creek Stamps, embossing powders and charms. 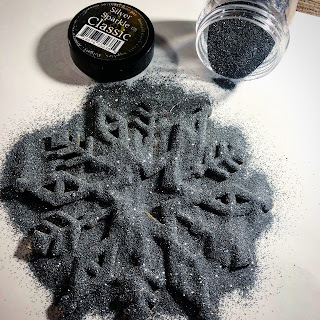 The snowy embossing powder really does look like snow. If you would like to follow along, I have a step by step instruction video for you here, or you can watch on YoutTube. 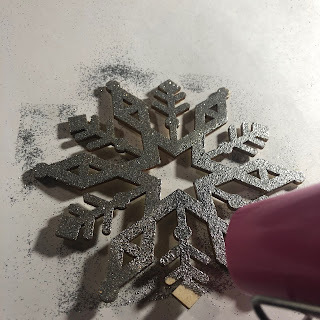 I hope you enjoy this and it inspires you to get out your stamps and embossing supplies and make something hand made for the holidays. So here are the Emerald Creek supplies you will need. Every Year I seem to have a box from the advent calendar that needs to be replaced or repaired. This year Number 15 had been eaten by dog and so I grabbed a new one from the stash of Dollar Store and Michael's boxes I have laying around. 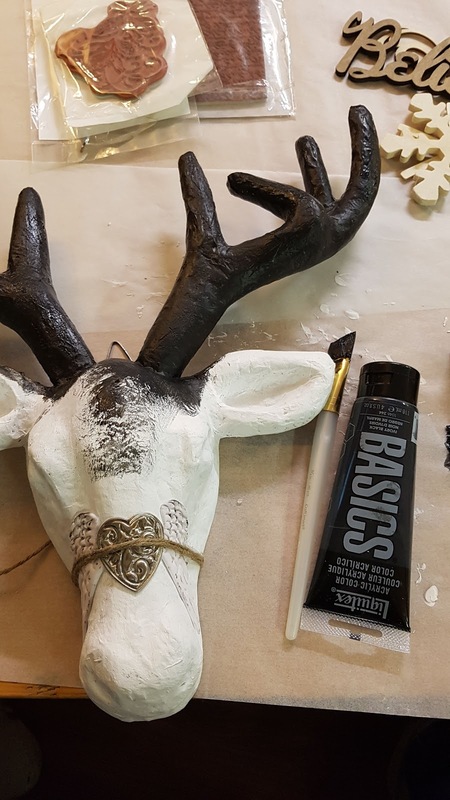 A quick wash of purple paint, watered down and let it dry overnight. I trimmed the base using my Ranger Embossing Dabber and a paint brush. Then I wanted to paint the numbers on but couldn't find my detail brush so in true Kim fashion I just looked for an easy solution and the Gel Pen was the answer. (you can emboss any smudgeable ink, just remember to do a test first). Because the wood is really porous, I had to emboss each of the numbers in 2 parts so the ink was wet enough to hold the embossing powder. Up next, stuffing it with the treats. Thankful Dare with her Colorful quirky zine with a twist entry. Cathy please email Katelyn at info@emeraldcreek.co for your prize code.